*yawn* It has been a whirlwind 2 days ... which I suppose was to be expected with The Trucker's 30th Birthday :) Again, I am still a little in awe of the fact that I got to spend it with him. I still very clearly remember when all I had composed in my head were my Xmas and 30th Birthday smses to him and thought that'd pretty much probably be the last time I spoke to him. It hurt terribly. But instead my world turn upside down and I am still living in a perfect dreamworld <3 Haha. That said, I was left dreadfully unprepared for his birthday with a mere 3 weeks notice that I'd actually be around to share it. I had thought and ummed and aahed over a gift last year already. I had the perfect thing picked out. And then we broke up. And he bought it for himself. I had nothing. No ideas. And on top of that we've been busy almost every moment of every weekend since we did get back together. I haven't had time to think let alone do. I won't lie, I was terribly unprepared. But I came up with an idea, one I definitely couldn't get in time for his birthday, but an idea nonetheless. And I found the perfect thing to complete the theme for him on the day. Which I discovered on Monday was never going to arrive because the Post Office is apparently on strike and the package that I needed was sitting at the Post Office unmoved since the company it was ordered from dropped it off 10 days beforehand. I went into a bit of a frenzy on Monday, trying to wrack my brains for something I could do to make his day special ... I know, he is like me and it's more about the things we do for each other thruout the year, than on any specific day, but it was his 30th and I WANTED to do something to make it special for him. So on Monday evening when he got home, there were 2 glasses of champagne (with Maraschino cherries!) and 2 cupcakes, one with a candle waiting for him. I think he was more surprised than anything. I told him that I knew it wasn't his birthday yet and he didn't believe in celebrating before the fact, but we weren't celebrating his 30th, we'd do that on Tuesday (his birthday). Rather, we were toasting his 20s. It's an important decade and deserved a proper send-off. I remember looking back at mine ... it held so many milestones, the least I could do was help him remember all of his. So yeah, that was Monday evening. He decided he wanted take-out to celebrate the last day of this decade so Steers it was. 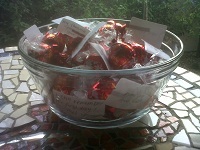 On Tuesday morning I left a large bowl with 30 Red Lindt Balls each with a personalised message for him attached with red ribbon ... like Lindt fortune cookies - haha. "A bowl full of love" was what he called it. I knew he'd appreciate the time and thought :) He knew his real present was coming later anyway. In the evening when he got home, we had some more champagne and he opened his presents from his mom and I told him what I wanted to get him (you will have to wait till it's bought ...). I think he likes it :) I think it'll help when we can go together and pick out the right one. Oh, and don't feel sorry for him for the day passing with so little pomp and ceremony ... there are many celebrations planned (much like all of mine - ha ha). Aside from dinner last night, we're planning a visit to Sun City (I've still never been) Valley of Waves and Pilanesberg this weekend (this is as yet unconfirmed) as well as our long weekend in Sodwana in March (which we were supposed to be leaving for today, but there is apparently a big fishing competition on using all the accommodation). Oh, and in case you thought I was feeling left out, yesterday I booked our long weekend for my birthday to Kruger Park :D Yes, life is very good! Eep. And I've just realised that I am now dating my first boy over the age of 30! Hahahaha.